seARTs and the Wearable Arts Group are joining Massachusetts Art Week with a NEW Spring Kick-Off Show to be hosted by the Castle Manor Inn in Gloucester MA on April 26-28. We are taking a bit from each of our past events to put together a fun weekend exhibit with sale, social, and special happenings. The event will kick off with a cocktail reception on Friday evening with appetizers and music, and will continue through Sunday with other special events. RSVP now on Eventbrite for all the events. Cape Ann Artisans are among the most established artists currently living and working on Cape Ann (Gloucester and Rockport, MA). Some studios are centrally located while many are tucked away among Cape Ann’s distinctive and diverse neighborhoods. Beyond the biannual Open Studio Tours, individual artisans are engaged and active in Cape Ann’s thriving arts community; during non-tour times many can be found working in their studios by appointment or at other events in the area. We invite the curios and adventuresome art-lovers to visit us off-season for a deep dive into our creative life on Cape Ann. All studios are open between 10am and 5pm each day; look for our bright pink banners that mark each studio. More details and background available here…. Treat yourself to a class and then start shopping! For the first time, Beth will have some new "headpin" style pieces available for sale, in both earring format as well as loose - so you can design your own creations. With over 40 vendors, the Bead Affaire is much more than a bead sale. You will find unique art glass pendants, necklaces and bracelets in addition to silver charms and findings, beads by the strand, chain, leather cord, polymer clay beads and jewelry, crystal, lucite, metal components, vintage beads, beading kits, accessories and much, much more. I'll be open late this evening too and happy to help you shop for your favorite person! 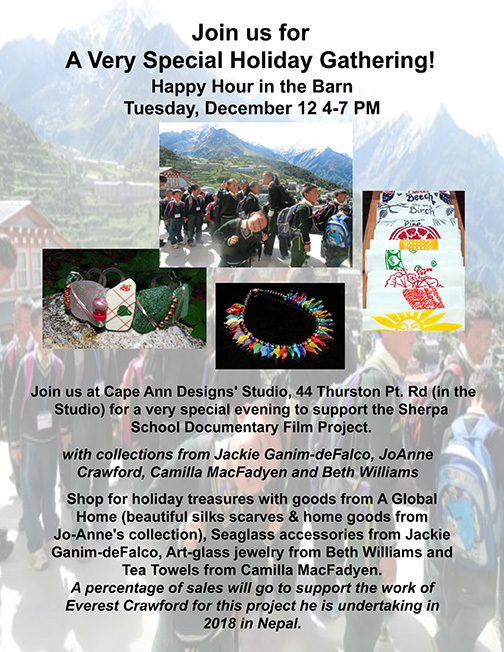 Visit my Studio for an evening of holiday shopping and a warm beverage! Open late until 9:00PM. Bridge Cape Ann is teaming with Riversbend Restaurant to host a special night of holiday shopping. Enjoy their famous flatbread pizzas & full bar while shopping from a very select list of vendors. This is a FREE event. Spread the word! Beth Williams . Art Glass Beads & Jewelry will be joining Sea Meadow Gifts and Gardens at our Riversbend Holiday Sip & Shop, Tuesday, December 5th 5:30-8:30! Bring a friend! Now in its second year, The American Craft Fair is a highly curated fine craft sale set in the beautiful venue of the Stoddard Education and Visitors Center of Central Massachusetts' premier Botanic Gardens. Crafts include jewelry, fiber art, clothing, woodworking, furniture, floor cloths, ceramics, toys and much more, all made by hand in America. Open to the public: Sat. and Sun. Oct. 7th and 8th, 201710-5 at the Annisquam Village Hall in Annisquam. The Annisquam Village Church receives 25% of all sales. Wide range of exhibitors – artists, jewelry designers, wood carvings, ceramics, pottery, children’s handpainted furniture, gourmet jellies, silk scarves, leather goods, knit wear etc. Celebrate Wearable Art! It’s not just a runway show. It’s an opportunity for every creative “maker” to find a new way to showcase their artistry and for true patrons of hand-made, one-of-a-kind jewelry, clothing, and accessories to experience the art in full living color. We're now looking forward to our Celebrate Wearable Art Runway Show 2017, coming in October--a show not to be missed! With dedicated talent and volunteers we continue to build this exciting destination event for the region. Shop for beautiful, hand made jewelry, clothing and accessories created by carefully selected artisans. Enjoy fabulous networking, light appetizers, and a cash bar with the backdrop of Gloucester's working waterfront.